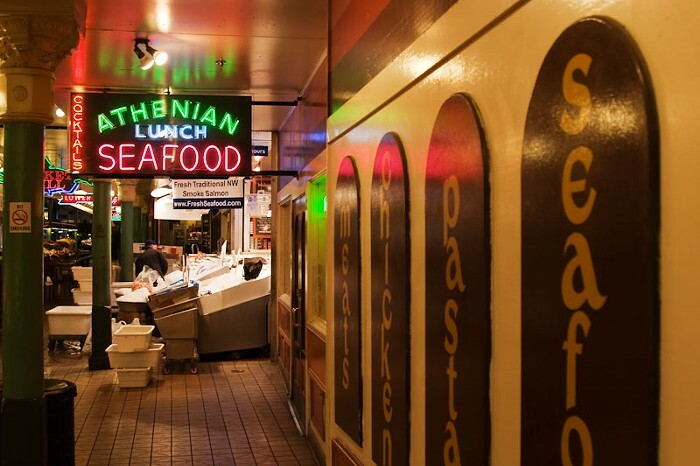 The food is nothing to write home about, but it's worth shoving your way through the Pike Place Market tourists gawping at fish to get to the old-school, unfancy bar at the Athenian. There is a stunning view of Puget Sound, and furthermore, the beer here is the coldest beer in the world. You must get draft beer; they superchill glass mugs and fill them with beer so near freezing that, amazingly, tiny beerbergs form on the surface of your beverage. A sunset here with a cold, cold beer is one of the world's truest delights. Happy Hour Mon-Thu 4-8 pm; Fri-Sat 4-9 pm ($1.50 oysters, $4-$5 food menu, $4 well drinks, $5.50 house red/white wine, $8-$9 specialty liquors, $4.50 microbrews, $5 cider and stout, $4 Budweisers).